Currently on Backorder till further notice. Please note wheels are 6-8weeks lead time. Any questions please contact us. 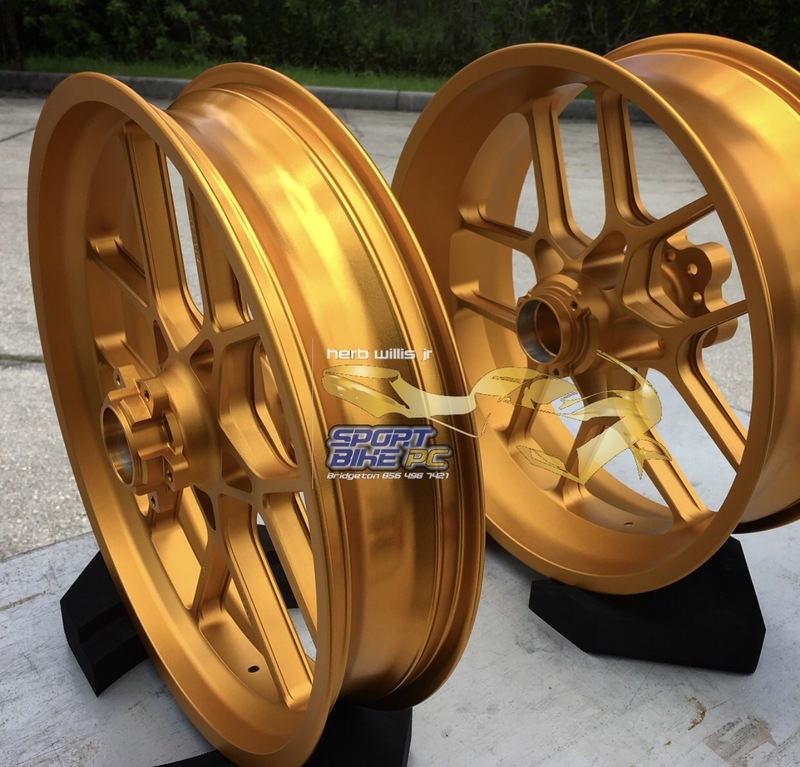 Wheels Are Available in A Shot Peen Finish (Gold set in Image Gallery) for additional $50/per set. Please email or call for more information on this service. 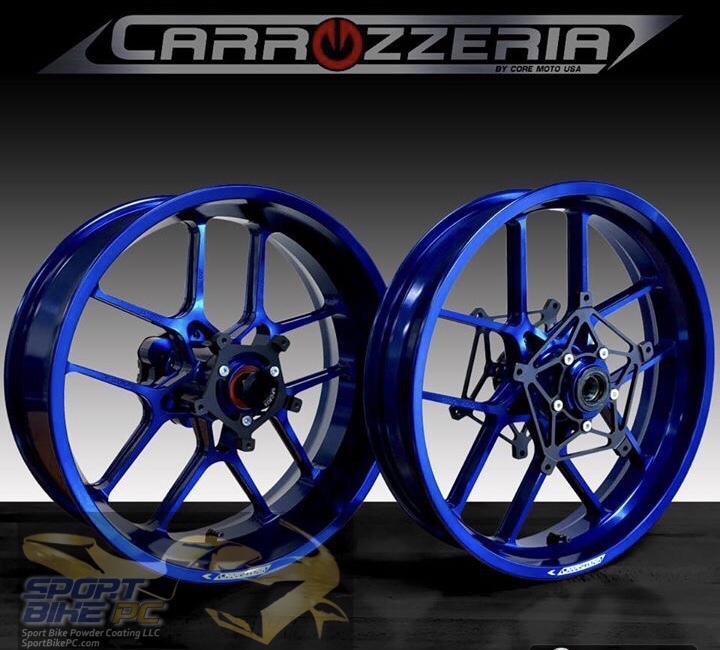 25 years of top level motorcycle racing engineering experience lead to the development of the Carrozzeria V-Track wheel. Keeping the Y-Spoke Design, the updated 10 spoke V-Track wheel is an evolution of the original 12 spoke V-Star wheel. 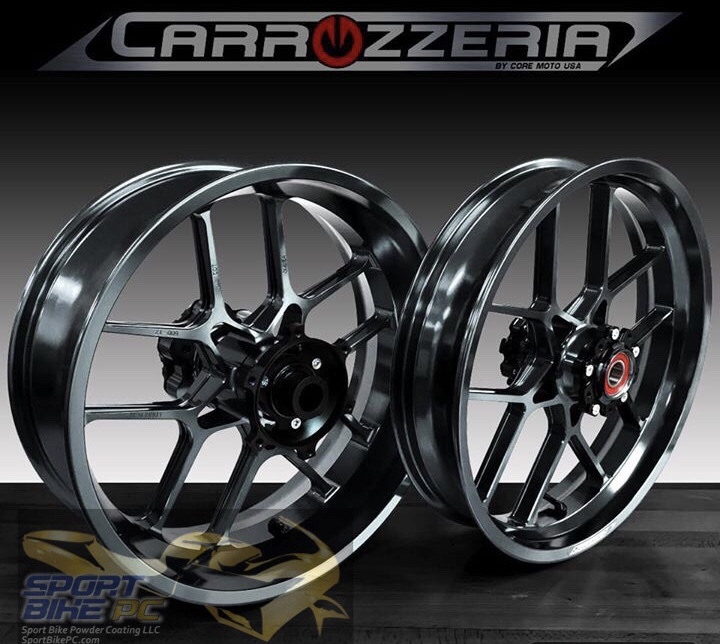 The new V-Track is lighter than the original but just as strong.As of 2016 Carrozzeria wheels are produced by Core Moto USA, further improvements have been and will continue to be made to component designs, application fitment and material finishes. We strive to make the best product possible. 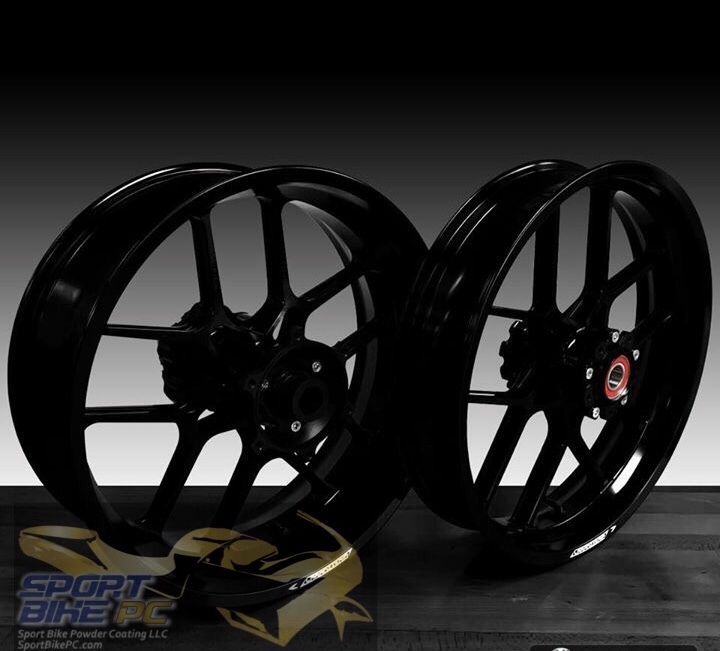 Available Anodized wheel Colors: Gloss Black, Satin black, Bright dip clear, Titanium Gray, Electric Blue, Wine Red, Bright Gold, Deep Purple, Emerald green and Orange are available to order for any model. Decreasing unsprung weight (weight below the suspension) and rotational mass greatly improves several responsive aspects of usable performance you can actually feel. More info about unsprung weight and rotational mass at the bottom of the page. About the wheel: CAD Designed one piece proprietary Forged monolithic hub design. Carrozzeria wheels are true forged wheels, purpose built for performance. Rather than using a market available generic forged blank, Carrozzeria wheel forgings are specific to each model we offer. Although this limits the amount of spoke designs and sizes we can offer, it nets a better quality product overall. Each wheel starts out as an aluminum billet that does not resemble a wheel. This Billet is then heated and placed into a 6000 ton controlled Hydraulic constant pressure forge and roll machine, This creates the basic shape of the wheel profile. This process is highly controlled to distribute the grain of the metal in a way that optimizes the strength of the wheel requiring less material (weight) needed in the final product. Constant pressure forging creates a more controlled and repeatable product than traditional drop forging. After forging, the 90% forgings are turned and milled by robotic loaded CNC machines to remove material and give the wheel its final shape. Equipped with high quality smooth rolling bearings from genuine top tier bearing manufacturers. Currently the availability of counterfeit bearings is a worldwide epidemic. Core Moto only sources genuine brand name bearings from top tier bearing distributors or factory direct to ensure tolerances and material compositions meet specifications. Our bearings are in most cases larger and wider than stock for more stability. We also choose a bearing seal type that is suited for long service life when maintained properly. Ceramic bearings are available upon request as an upgrade. We only suggest using ceramic bearings or regularly maintained race bikes. New wheels made by Core Moto come with serviceable 6 pot cylindrical Cush Drive System for High HP Applications. 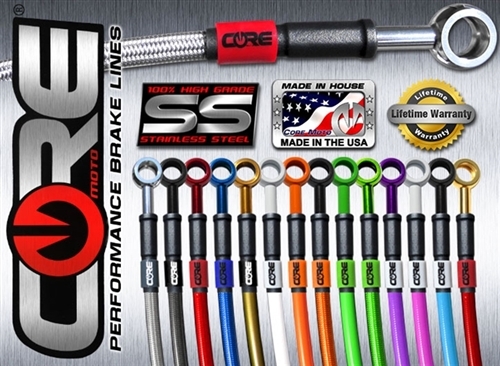 In 2016 Core Moto developed a new Cush drive bushing to replace all current and previous Carrozzeria Wheel bushing units. Our new bushing is now a single bonded hardened steel and firmer compound rubber unit. 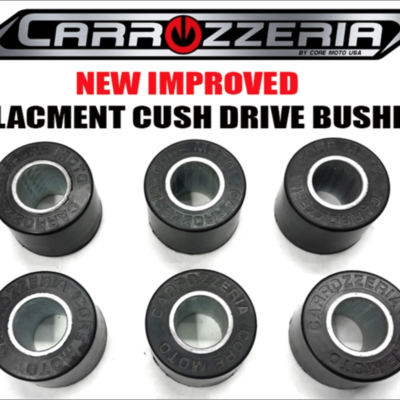 If your wheels were made before Core Moto started producing Carrozzeria wheels in 2016, improved bushings can be ordered in our genuine replacement parts section or from your favorite Core Moto dealer. Anodized CNC Alloy Spacers, Carriers and Distance Tubes pre installed in the wheel. Some spacers will be shipped uninstalled for wheel packing reasons, but will come with a diagram for easy placement. Each part is either laser or mechanically engraved with unique part numbers to identify the placement location. Most front wheel spacers are now fully captive on the front using oil seals and bearing captive on the rear. 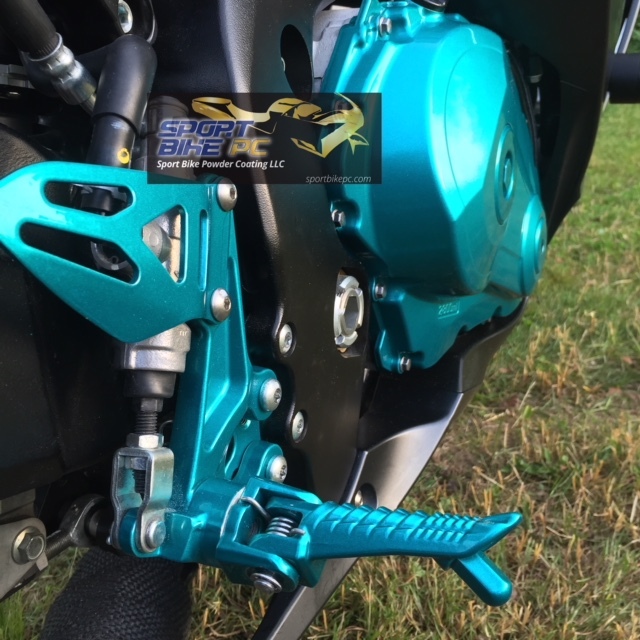 Rotor carriers will be pre mounted (except S1000RR for packing reasons) with stainless steel hardware as to not interfere with modern wheel speed sensor pickups. All rotor carriers are designed to accept OEM or aftermarket equivalent brake rotor discs and rotor bolts. New carriers are designed to optimize weight savings while offering a very rigid mount. Due to the bolt circle diameter of the cush drive system, All V-Track Wheels require the use of a Kawasaki bolt pattern sprocket. Parts diagram: Exploded view parts diagrams are included with most wheels orders. These are to be used to ensure you received the correct parts and put them in the right place when installing your wheels kit. This is to be kept for future use in case you need a new part due to loss or damage. Reducing rotational mass increases acceleration, decreases braking distances and improves handling. Lighter wheels decrease the amount of power needed to get the tires spinning. This also reduces the amount of braking power needed to slow down the spinning wheel down. Rapid transitions from acceleration to deceleration benefit greatly from lighter wheels. Gyroscopic force is also reduced with lighter wheels, improving handling by reducing the amount of force needed to tilt the spinning wheel axis side to side. The reduction of gyroscopic and rotational inertial forces are compounded by higher speeds. Q:What do I get with my wheel order? A: Most wheel sets will arrive with all components installed, except the rear sprocket carrier and spacers, these can be installed by hand without tools. All you need to do is mount tires, sprocket and OEM Rotors. These are complete kits. Some select models will require you to reuse front spacers and speed sensor rings. An exploded view diagram is provided with most wheel kits, for part location and replacement part ordering in the future. Q: Do I need special brake rotors for Carrozzeria Wheels? A: No, most Carrozzeria Wheels by Core Moto made after 2016 will accept any rotor that fit your original wheels? If your model requires a special rotor, it will be clearly noted in the top of the listing. This is for only 2 models as of today. Q: What sprocket will I need? A: V-Track wheels require a Kawasaki bolt pattern sprocket: see detailed answer in product description. Q: How do I clean my wheels? A: We recommend using Lemon Pledge and a microfiber cloth to clean all anodized surfaces. If heavy cleaning is required we recommend a mild car wash soap that is acid free. Do not use degreasers or acidic washes. Q: Will my wheel set fit on other bike brands and models? A: In most cases No, please assume this is not possible when purchasing used wheels or a new bike. This is especially true with Carrozzeria wheels produced before 2017. 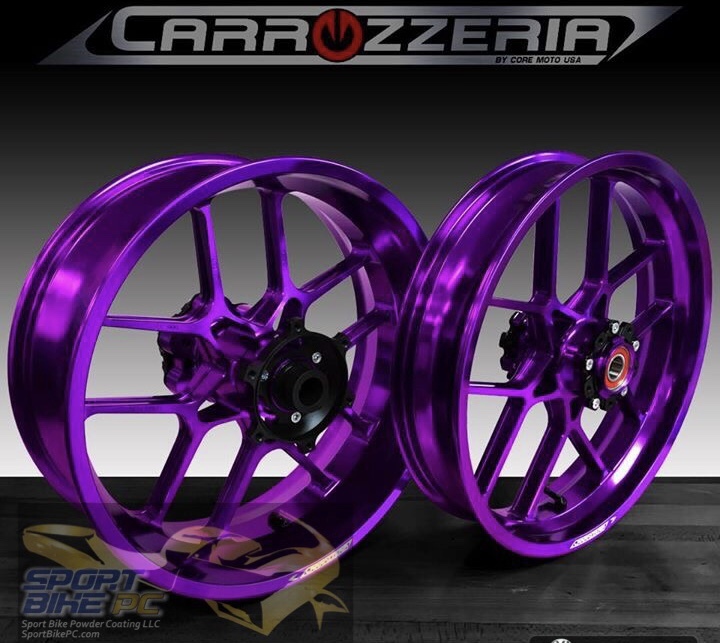 The former owner, Carrozzeria USA INC made the wheels very specific to each model.. we do not have technical fitment data related to models produced before 2016 and will not be able to assist with re fitting to other models. We do have data on wheels produced in the 2016 year but most are not re configurable. Most but not all wheels produced by Core Moto since 2017 can be modified to fit other models with component changes. Please contact customer support for cross fitment info if the wheels were produced after January 2017. Q: Are the wheels painted or powdercoated? 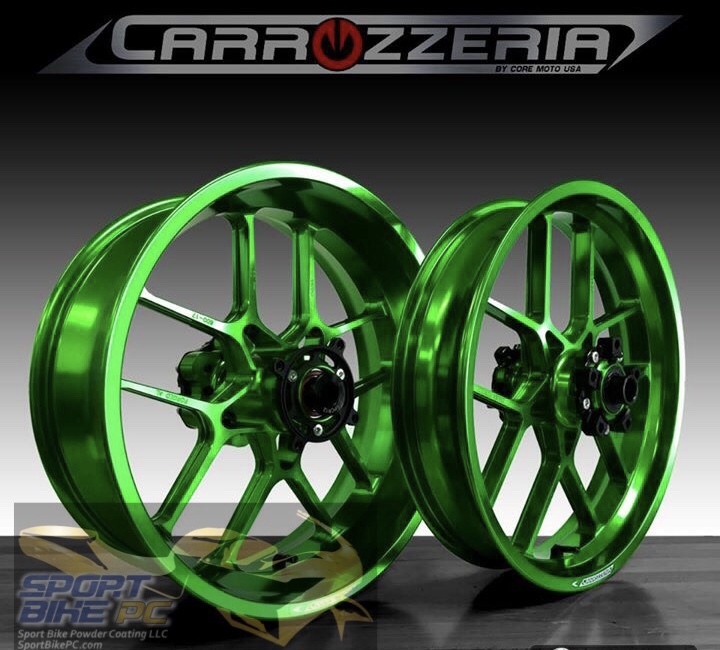 A: No, Carrozzeria/Core Moto wheels are color anodized. This is not a coating, in simple terms it is a hardened surface treatment that is dyed. Q: What bearings do I need to replace my worn or damaged bearings? A: For wheels produced after January 2017 we can tell you what is needed based on your wheel P/N or application. For wheels produced before 2016 by the former company owner we will need to refer you to our replacement bearing section on our website that explains in detail what is needed to determine your bearing type. Q: What is the weight difference between Carrozzeria and OEM wheels. A: Generally our V-Track wheels save 20-30% on average of the overall weight. Additionally compared to OEM wheels, Carrozzeria wheels are lighter further away from center where it counts more. When Core Moto took over the Carrozzeria brand, we were not provided weights of OEM wheels. When we measure bikes in R&D we are typically working on new floor models owned by dealerships and in the past have not weighed OEM wheels do to tires being mounted. This is something we intend to start doing soon. As an example, the 2016 Aprilia RSV4 rear OEM wheel is very light by OEM standards. The OEM wheel weighs 3.1 lbs more than a Carrozzeria V-Track wheel fully assembled. The weight difference is typically higher on Japanese brands. Q: How do I repair a bent or cracked wheel? A: We can not recommend repairing a damaged wheel. Q: What size wheels do you offer? 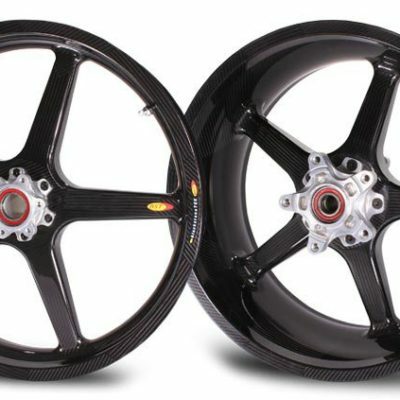 Q: Can you put a 6″x17″ inch rear wheel on a bike that came from the factory with 5.5″ rear wheels. A: in some cases yes, but not all. 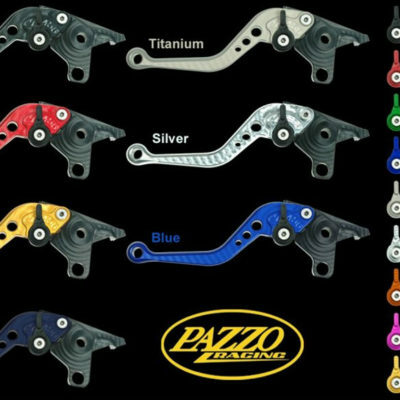 For example 6″ conversions is a popular option we offer for the R6, while we only offer a 6″ conversion for the Panigale 899-959. Please check with customer service.